A Matter of Loaf and Death, a Wallace and Gromit short film from Aardman Animations, has been nominated for Best Animated Short Film at the 2010 Academy Awards. 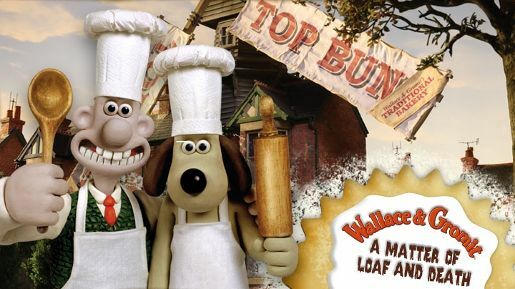 A Matter of Loaf and Death, launched in December 2008, is a mock murder mystery based in a new bakery business started by Wallace and Gromit. Gromit learns that bakers have been mysteriously disappearing, and tries to solve the case before Wallace ends up a victim himself. The film introduces a new love interest for Wallace, Piella Bakewell, a bread enthusiast voiced by Sally Lindsay as well as, for the first time, one for Gromit: Piella’s dog Fluffles. Filming/animation was shot by director/executive producer/writer Nick Park via Aardman Animations with director of photography Dave Alex Riddett	, editor David McCormick, art director Matt Perry, producer Steve Pegram, executive producers Peter Lord, David Sproxton, with writer Bob Baker, VFX supervisor Bram Ttwheam. See the full credits list at IMDB. Original music is by Julian Nott.